When was the last time you gave yourself permission to stop and relax? To wear Nice clothes or invest in some pretty underwear? To have some time out just for you, to nourish yourself to preserve the wonderful person you really are? Do something for yourself that you alone would enjoy like having a bath, reading a book, going for a walk? You may think this is selfish or you may say I just don’t have time or maybe you have never considered taking timeout for yourself. 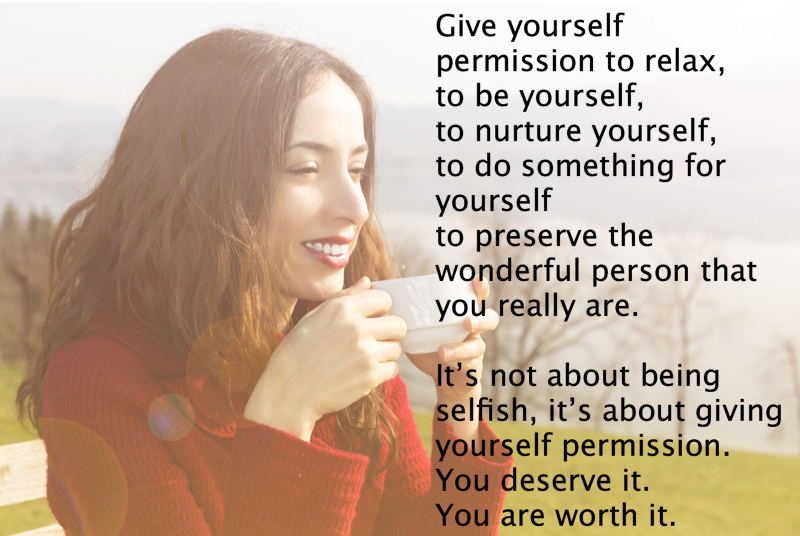 It really is about giving yourself permission. Permission to discover yourself, to be yourself and to love yourself. Now it is your time. Give yourself permission, try something new and even say yes I deserve to do this, have this or become this person. Enjoy your discovery! Do that course you always wanted. Have some time out with your friends. Give others permission to be who they are. Regardless of whom they want to be whether they are joyful, happy, sad or angry. It is their right to be who and what they want to be and do what they want to do. You don’t need to change them it is their responsibility to change if they want. You don’t need to take on their stuff or emotions, even though they maybe family, friends or even close work colleagues. Sometimes it is hard, because I know as women you want the best for your family, friends and work colleagues. But the responsibly is theirs. Remember it is their choice to be unhappy, to be feeling sick, to be angry to be disorganized. We all have different ways about us and that is what makes our world an interesting place.